I have been quietly working on a game for IGMC and I figured I would share what's going on with the game's development. I'm a one man team, I have been doing programming and graphics in Gamemaker Studio 2 and have gotten fairly far with the core game features. I'm always open to ideas if anyone wants to share some thoughts. I have the world exploration system developed and have a test map but I am focused on getting the battle system up to snuff right now. If the core battle system isn't fun the game won't be fun, so I have to focus on the game loop an make sure it's rewarding. The idea is that through battles and exploring and interacting on the map you get cards that let you do different attacks. These cards are put into your collection and you can choose a set of cards to make up your battle deck. I hear the concept is similar to Mega Man Battle Network but I have never played those games. 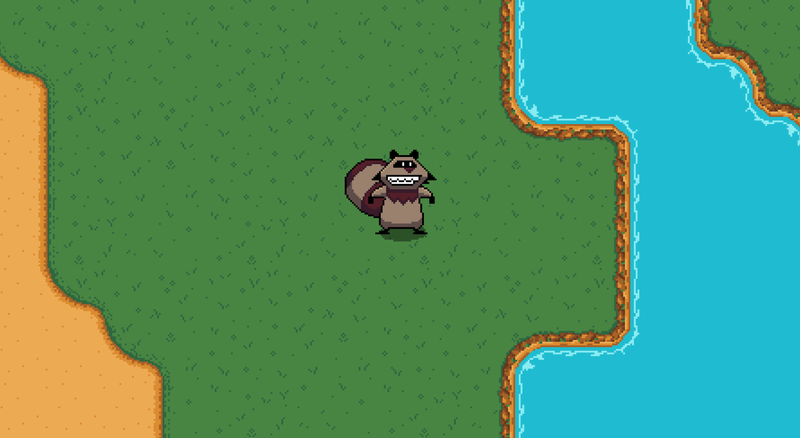 Here is a view of the main character in the world map, for now I'm just calling him the raccoon. Everything is really bare bones right now but I am making a lot of progress on stuff that isn't visible. The battle system is set on a grid where both you and the computer have a portion of the grid and play cards in real time to try to hit defeat each other. Notice the raccoon's emotional support bear. I would like an emotional support bear too. Where can I get one? XD I want a bear, too! Here is a quick update on how development has been going! I've been working on the control scheme for the game's battle system and it's coming along nicely. I don't have any enemies or attacks from the cards in there yet but everything flows well and the control feels pretty intuitive. Here is a GIF of how the battle controls work. 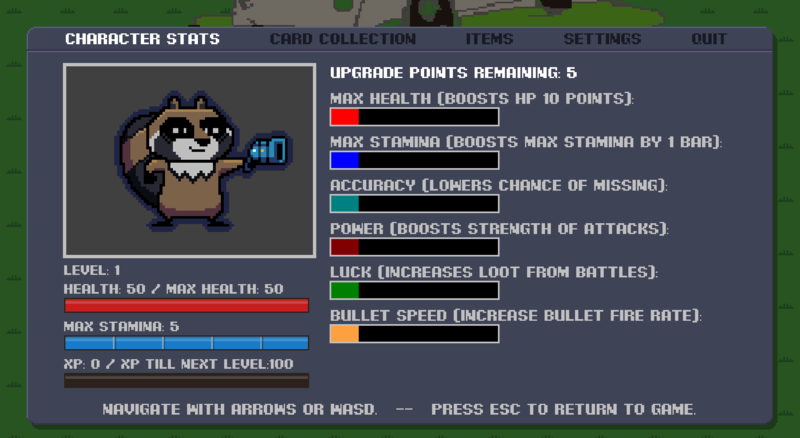 You control the raccoon with the arrow-wasd keys and fire off attacks with the mouse. You have a basic Blaster attack which is always available. And you can activate cards from a deck to do special actions, such as have a pigeon (yeah misspelled in game) dive bomb the person you are battling, or have a turtle sit in a spot and soak up damage for you. The card controls are pretty simple. Right click to cycle the cards and left click to activate the card selected. After a special card is activated your selection defaults to the blaster. And I'm going to make it so if you don't fire the blaster it charges up the damage on the next shot. The game revolves around gaining more cards that will give you control over new animals which in turn do different attacks when you activate the card. 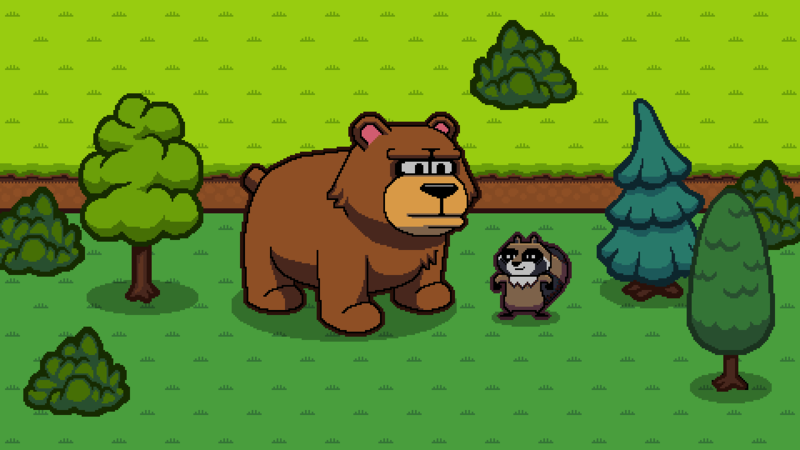 The story is about how the raccoon and the bear go on a morally ambiguous quest to stop the company that makes the game from mind controlling animals all over the world and forcing them into combat, by mind controlling animals and forcing them into combat to become strong enough to attack the company. Looking for feedback on a design thought. I have a gun that fires bullets and a button that cycles through the cards. Right now the right click is the cycle because you don't do it as much as firing the gun. BUT the gun fires automatically as long as you hold the button. I'm thinking about making the fire button the right mouse button and the select button the left mouse button. That way player's can rest their hand on the right mouse button to continuously fire. Then use their index finger to have more control over which option they choose. I don't want to use the mouse wheel because those are not very reliable to me in a chaotic game like this will be. What are your thoughts on using mouse controls to cycle through the battle menu? Would it make more sense to just have continuous fire on by default and make the right-click a ceasefire instead? Just a thought I had while reading through your stuff. I thought about that, but then I lose the possibility of a "don' t shoot this" object. I messed with it a bit more and I cracked it. It feels really intuitive now. You hold the left mouse to constantly fire bullets, you right click to select the secondary action card, while still firing bullets, and you release the left mouse button to activate the chosen card. you can also activate the card by pressing the left mouse button while it is highlighted. It's subtle but it made a big difference. Been working on the battle system and it is coming along nicely! Cards now trigger attack sequences on the opponent grid, that is what happens when the tiles flash yellow. If there was a bad guy on those spots they would take damage. Tonight I got an actor system in the battle engine where I can spawn an actor and give it data, like which team it is on, which behaviors to and stuff. I got the gun doing a charge attack when you don't fire it for a couple seconds it will do more damage. The ground work of the damage code is laid in, now I have to work out how the leveling in the game will be handled and adjust the variables. 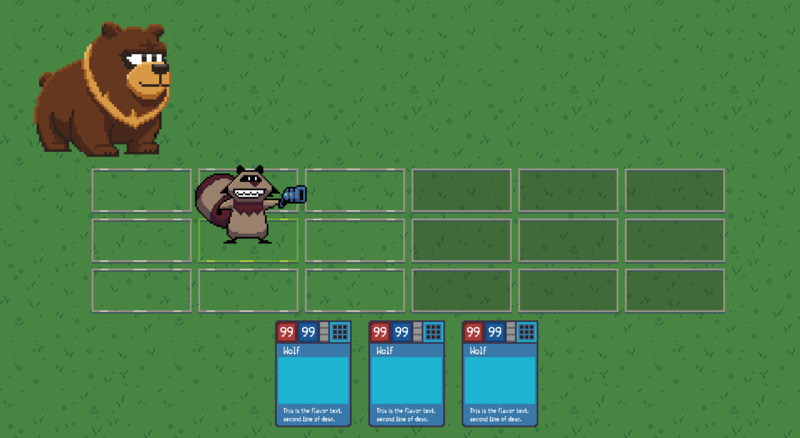 Then I have to clean up the UI and add damage numbers that spawn when you hit. That kinda stuff is nice to have so I'm focusing more on the broad strokes since this is a game jam after all. My next goal is to encapsulate the battle system and make it launch from in the adventure map using random encounters and scripted encounters. There is more UI work that needs to be done to the cards as well, to give you a better idea of what they do at a glance. Alright so I took a bit of a detour and learned how to handle deformation shaders to make the battle system pixelate the game when it enters battle. I think it turned out pretty good! Took me a while to figure it out and I'm sure I'll forget everything I learned before the next time I make one. To break everything apart I had to make a seperate VFX object to trigger transitions with. It's working pretty well. I can go back and forth between the world map and the battle system. Deck management system so you can see what cards you have and swap them out as you get better ones. Generic Enemy class to finish up the battle system structure. Attack animation handler and animations. I spent today organizing the structure of the game and setting up controllers for several elements. I also took some time to make some more art for the game and drop it into the world map now that the battle system is working a bit better. I've been working hard on this project. 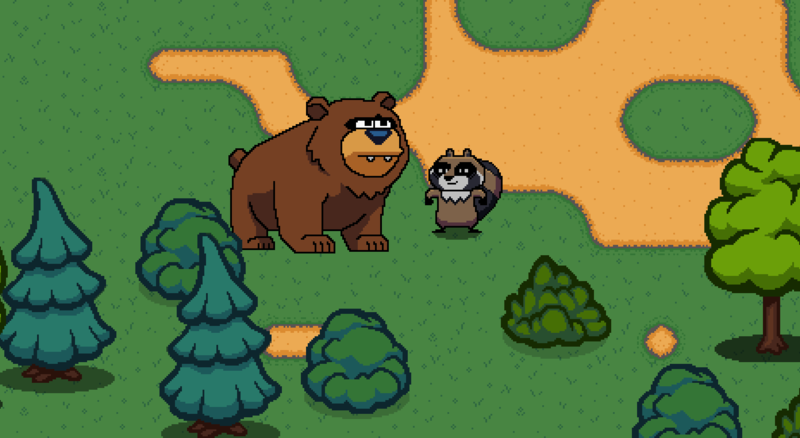 I've gotten a dialog and cut scene system up and running and been cranking out art assets for the world map. I decided to clean up the design of the characters. I have been working my way through scripting the intro sequence lately between that, the menus for the card collection and the AI for battles I have a lot on my plate. I talked to the Pixel Art subreddit and got a lot of really great feedback and updated the artwork a bit more. I'm going to try to make the game in this style. For the jam I will likely have to be a bit more quick an dirty about it though... just for the sake of time. Ok. this game is getting weird. :D I have the attack animation system working and will be able to populate several different types of animals into the attacks. 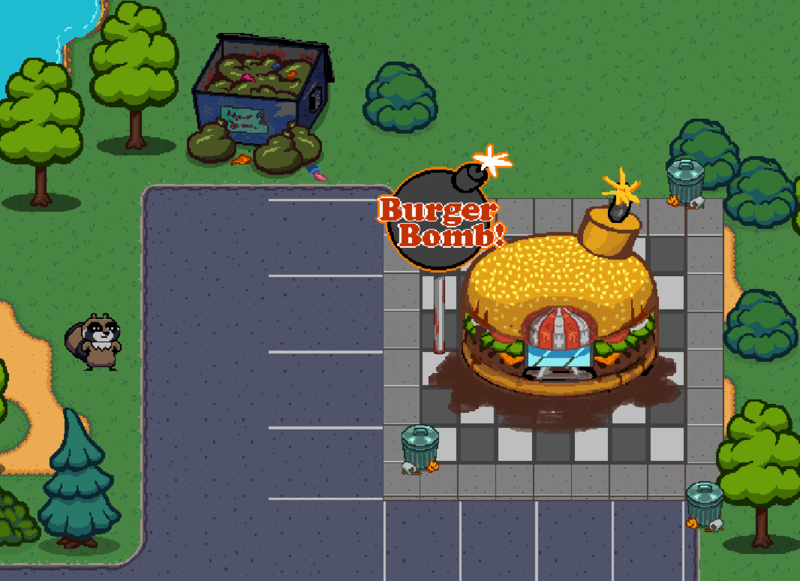 I've also been updating the tilesets and artwork and working on sound effects. The battle system has AI opponents that drop loot and scale by level. 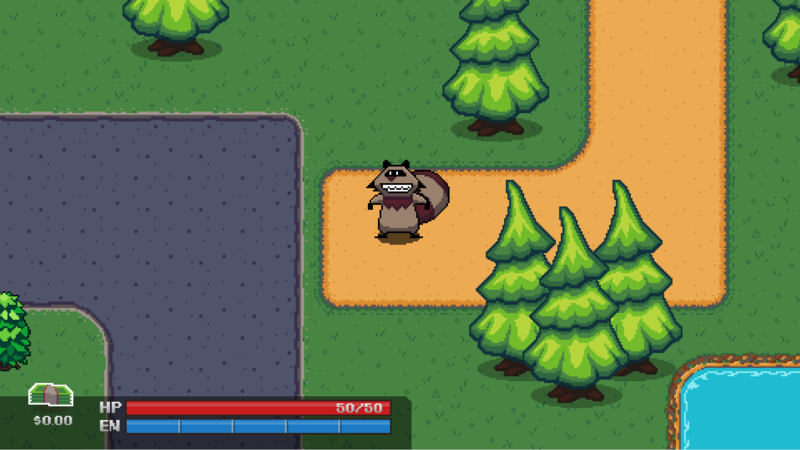 The player character levels up, gets stronger and can manipulate stats. You can add cards to your collection by looting them from enemies. You then can go into the menu and add or remove cards from your deck. 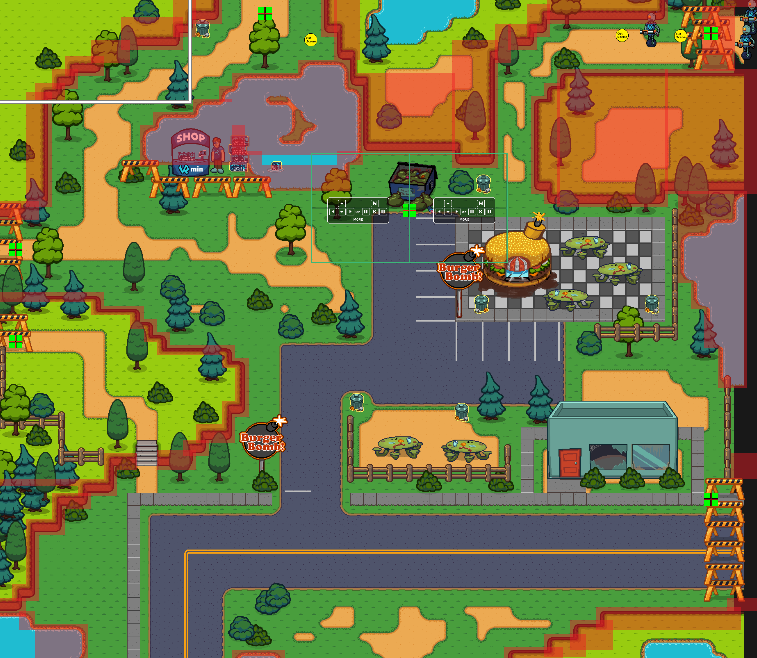 Still a lot of animation and artwork needed for the game to look nice, but all the placeholder sprites are in for the prototype elements of the badguys and attacks. Working on the menu system tonight. It needs a bit of work to make it easier to understand. Once that is done the rest of the week will likely be dedicated to populating the world with content. I don't know if I will be able to include some of the story around why the bear is in the battle window. BUT maybe I can squeeze it in if I don't sleep much. OK the menu is about as done as I think it's going to get. It is very quick and dirty, but it gets the job done for a prototype. Wow, that is a lot to take in. I just uploaded the game as it currently stands. I'm a one man team so I didn't get it as far along as I wish I had. But I think it's a solid effort for the time I had to work with. Good luck everyone! IF I wake up before the deadline I will likely fix a few more things and maybe do some more animation in the battle system.